Good sludge metal is from Georgia, right? Not anymore! 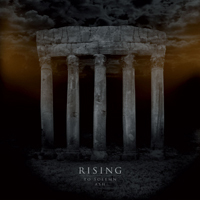 The debut album from Danish group Rising is first rate sludge metal. The style of the band brings the music of bands like Kylesa, Baroness, High on Fire and even Mastodon to mind. This is absolutely meant as a compliment since all of those bands are favourites of mine. The music of Rinsing is heavy like thunder but at the same time infected with some very catchy melodies. I am pretty sure that To Solemn Ash by Rising is not only a Danish phenomenon but something that will appeal to an international audience too. The album is quite varied within the framework of the style if not always too original (but who needs that when the formula of the music works so well!) and the production of the album is right on target. Finally it should be mentioned that the lyrics of the band are quite complex and worth a listen or perhaps a read after you have finished head banging to the mighty riffing and the thundering beats on the album. Rising will be touring Denmark and Germany this winter and will embark on a European tour next year. I for one can’t wait to see them live and I can only recommend this album to fans sludge, stoner and doom metal.